The Felix IoT platform provides all the capabilities needed to take advantage of the untapped potential that the Internet of Things has to offer businesses in every domain. Core to every IoT solution is the ability to collect incredibly large amounts of information, quickly correlate and analyze vast amounts of data and then automatically take action based on the results of the analysis. Felix excels in all 3 of these areas: aggregation, analysis and automation. The Felix IoT Platform makes it easy to collect information from millions of disparate connected devices and data services. The aggregation of data points streamed from these connected devices and services is seamlessly handled by Felix and made available to real-time and batch services alike. Industry-leading real-time analytics processing, batch analytics on massive amounts of data, predictive analytics and machine learning capabilities are all available with the Felix IoT Platform. Whether event driver or based on analytic results, the Felix IoT Platform has the capability to automatically take action in an IoT solution. From triggering alarms and sending notifications to controlling connected devices, Felix can help automate the IoT workflow for any enterprise. The Felix IoT Platform delivers unmatched real-time analytic performance with the flexibility to quickly and cost-efficiently deliver IoT solutions for a expanding line of business domains. The Felix IoT Platform dramatically reduces time-to-market as well as the costs associated with creating an end-to-end IoT solution. Providing all the foundational services, simple APIs and easy to use integration frameworks, a fully functional IoT solution can be implemented in a fraction of the time and cost it would take without Felix. Built on an architecture defined from the start to scale and perform at the levels required for the Internet of Things, the Felix IoT Platform comes ready to connect with millions of devices and process the vast amounts of data expected in an enterprise IoT solution. Being able to process and react to information in real-time is a must for any IoT solution to provide real, tangible business value. Felix has the industries most advanced real-time analytics engine. 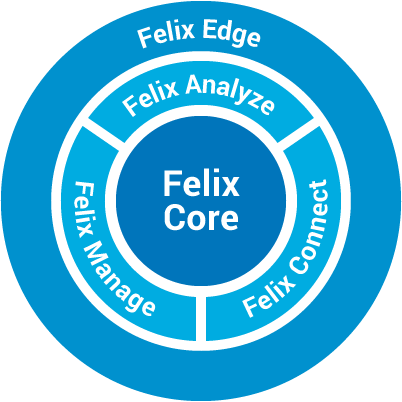 Horizontally scalable with the ability to quickly define and execute custom analytic functions, Felix’s real-time analytics engine delivers performance and flexibility that is unmatched by other IoT platform providers. From source-code licensing to Platform-as-a-Service (PaaS) options clients can use the Felix IoT Platform in the manner that best allows them to deliver on their business goals. Whether you have a large IT staff or almost none, the Felix IoT Platform and IoT Technology Solutions will work with your team to deliver the IoT solution you need. The Felix IoT Platform enables rapid delivery of complete IoT solutions with proven success in industries from healthcare to manufacturing and more. Highly scalable and extremely flexible, the Felix platform provides the foundation necessary to create secure, performant and full-featured IoT solutions for the most demanding environments.